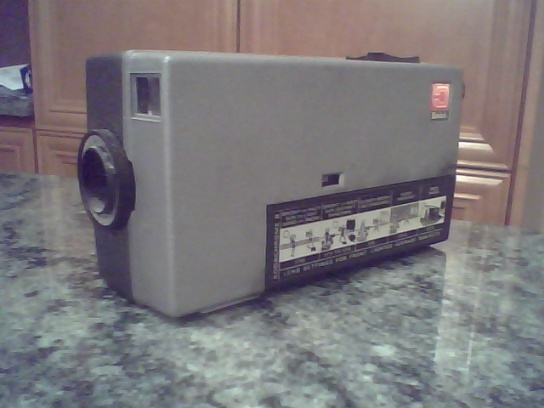 Last week my son picked up this Kodascope Eight-500 projector for the grand total of $5...amazing but more so when I plugged it in and it ran, the lamp went...everything, however I dont know much about it...any info anyone? well it started me thinking something I do from time to time and thought, this forum has 1900 members so I am going to ask if you can come up with a "Kodak" product from projector to film to still camera something thats "Kodak" you can add photos if you like plus details about the product...anything at all, I look forward with interest. Great idea! 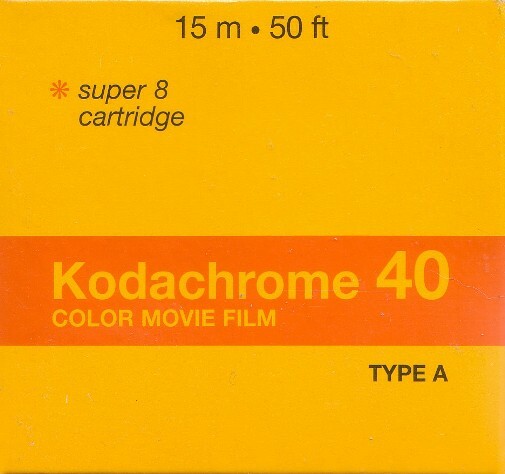 Since all films should start with leader, let's begin with some good old Kodak Regular 8mm and Super 8mm white stuff! 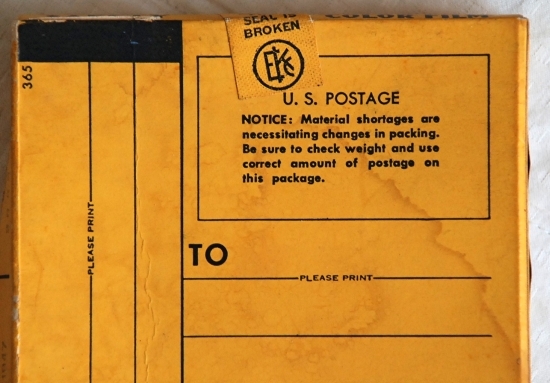 One vintage Kodachrome mailer, a symbol of many happy cartridges! 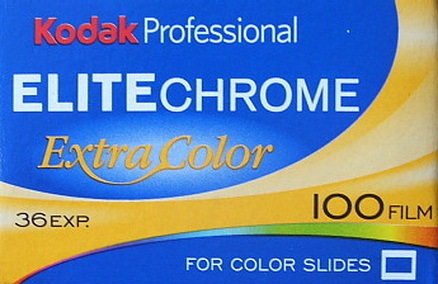 For years and years they weren't available in the US, but then in the last years of K40, Kodak offered them here packaged with a roll of K40 for about $13.50 a pop. All of a sudden shooting and processing Super-8 became very easy and relatively cheap. I bought my film ten cartridges at a time and it didn't take very long to use them up! Notice this one says "Kodak Processing not available in the United States"
Steve, are you sure that you did buy them from legal source? 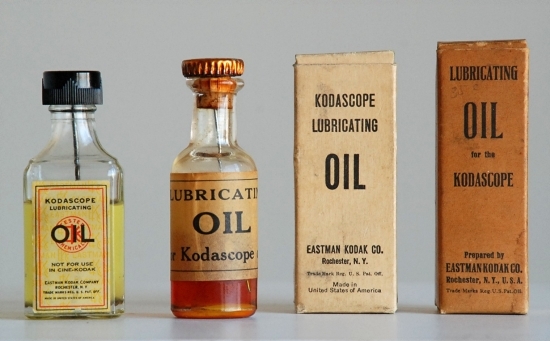 I read somewhere that Kodak was not allowed to sell this type of bundled good-service because it will breach the USA anti-trust law. That is why Kodak offered mailers (PK59) only for the USA consumers. I bought them direct from Kodak in Manhattan. Sweet deal: even by UPS surface I'd order them over the phone and they'd be sitting on my front steps the next day. Even back when I could buy them at a department store, getting S8 cartridges was not much simpler. The mailer simplified what happened on the other end as well. I believe that by the time they started doing this, Kodak had convinced the Department of Justice that the anti-trust issues were pretty much history. I guess it's hard to be a "monopoly" of any threat within a dwindling market. Now you have to put up a picture! Oh..ok Steve, I just knew that. The most stupid thing I have experienced! A couple of years ago, I was making a film about how camping is such a tradition in our family. I shot a lot of present day footage of camping with our son, but I needed something from the past to get the “tradition” part to work. My family didn’t shoot movies, but I have my Parents’ 126 camera and their albums, so I shot pictures of the camera and scanned the stills to help build up an introductory title sequence. Prince William National Forest, Summer 1968. I was six..but now I'm...NOT. Until I became involved in this project I never realized that 126 prints are square! I wonder how many people kept turning the camera sideways for the “Vertical Shot” before they realized it makes absolutely no difference! That camera has the extra special "Kodar Lens"! 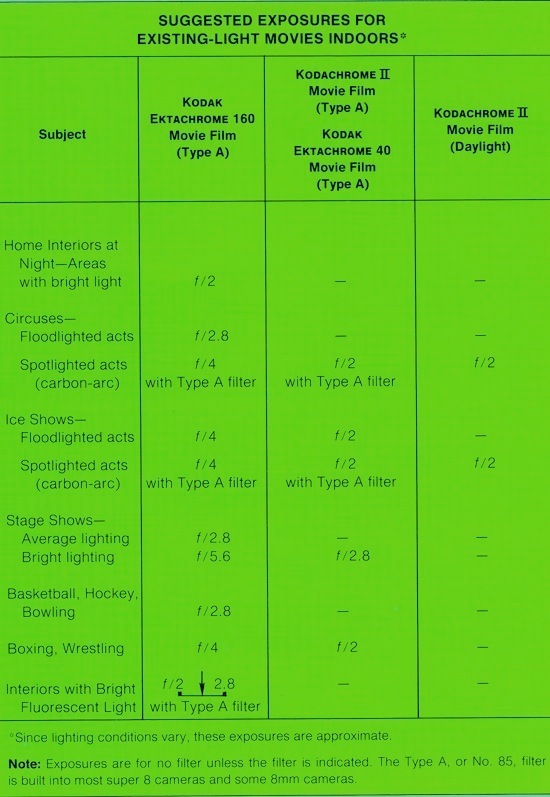 And remember, the recommended exposure for bowling is 2.8 (assuming you're using Ektachrome 160). -makes that Kodar seem downright..."Mod!" No real personal history...somebody was cleaning out an attic, brought it to me and asked "You wannit?" Hmmmmm...B&H has film for it! Firstly, thanks Steve and Doug for adding to this topic its been very interesting and I hope more can be added. Last week I was looking at an old Kodak box Brownie I was given a couple of years ago, anyway I decided to do a little research on the web and what I concluded was how little I new about Kodak and there products and landed up spending a lot of time reading about the history of Kodak and in particular the little box brownie. For many of you out there that have a lot more knowledge than I, it might not seem to important but for those of you like me I thought I might mention some of my findings. Some of the following comments are taken directly from certain sites so I hope you dont mind. 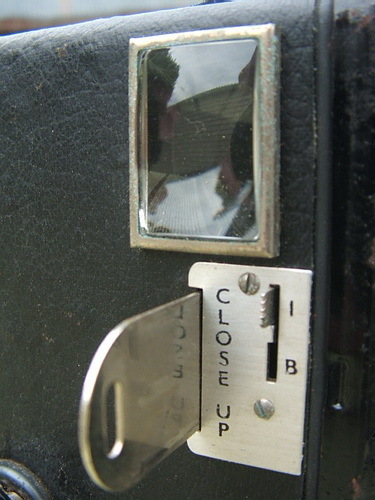 In this photo the sliding lens is in place for shooting 5-10 feet when its moved to the left it clears for 10 feet and over. although the camera is looking a bit rough a good clean is all it needs and the shutter works fine. 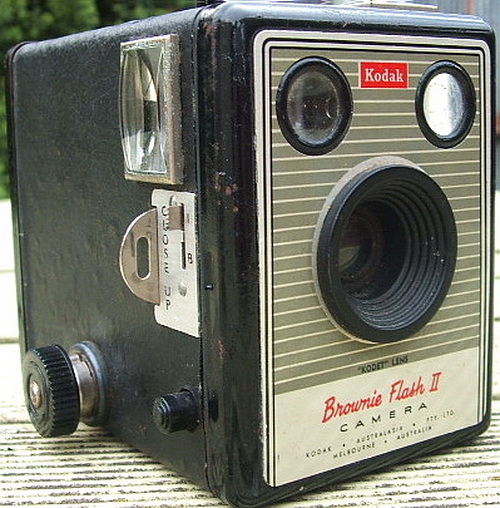 The Kodak Box Brownie came into being in 1900 the price $1 all up One hundred and twenty-five Brownie models with a production run of seventy years. With its introduction George Eastman made the photograph affordable to everyone. The term "Snapshot" was a 19th century hunting term meaning to shoot from the hip without carefull aim. 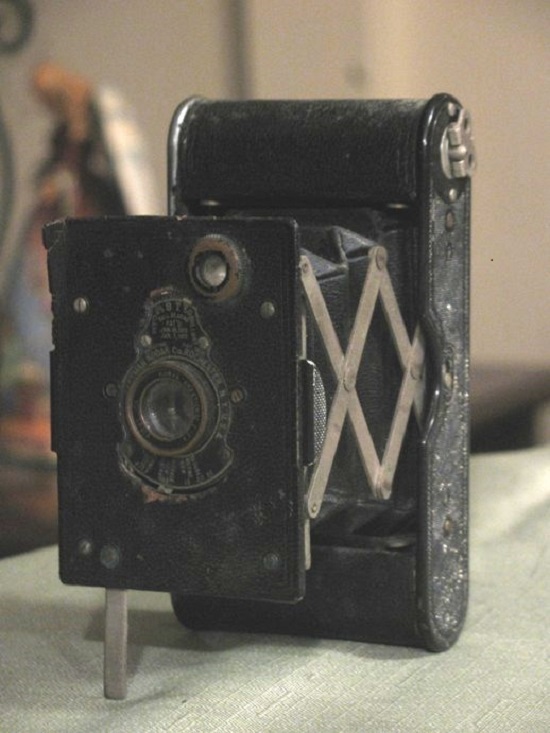 The term was applied to photographs in 1860 but became popular with the introduction of the hand held Kodak Box camera. To finish with here is an interesting quote from George Eastman. 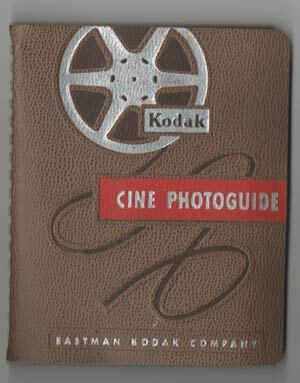 Here's a vintage KOdak pocket guide. There's a flip side of 8mm film that some of us do and some of us don't: that being filmmaking. Showing films is a habit of the evening, of winter in particular. Shooting film on the other hand is a habit of bright summer days. 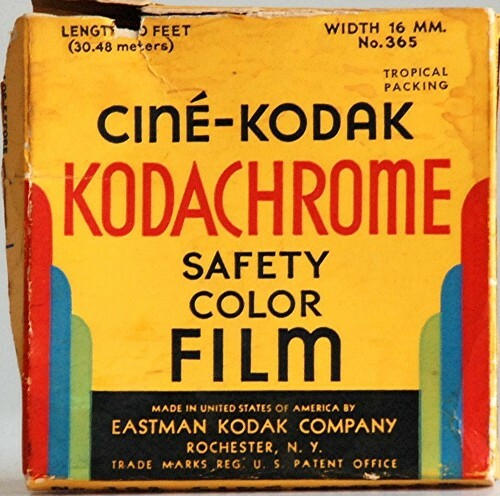 Kodachrome movie film was meant for those days, and has preserved them for the better part of a century for millions, but that time is quickly drawing to a close. We have some great old family friends whose entire 8mm Universe is 50 feet of Kodachrome shot at their wedding in 1955. It's been my pleasure to show up with a projector every 25 years and help them relive those few minutes: as perfect as the day they were first exposed. 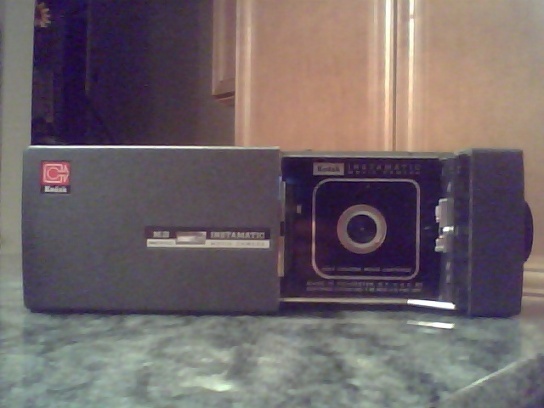 The cartridge above is one of three I have left to use before the end of the year. May I use them well. "Those were the days, my friend! We'd live the life we'd choose. For we were young and sure to have our way!" 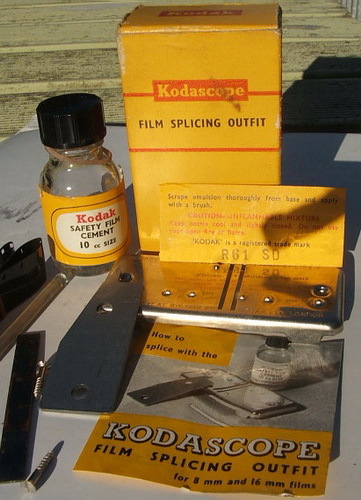 Kodascope splicing kit anyone ever used it? 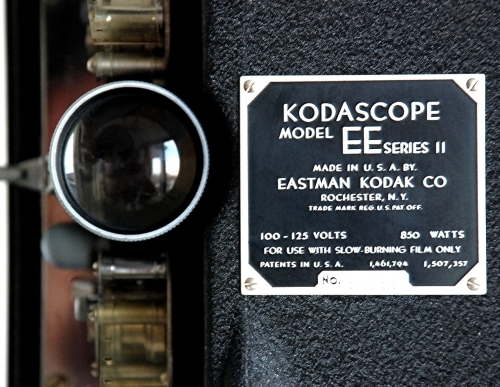 A Kodascope Eight-46 projector Made in England. 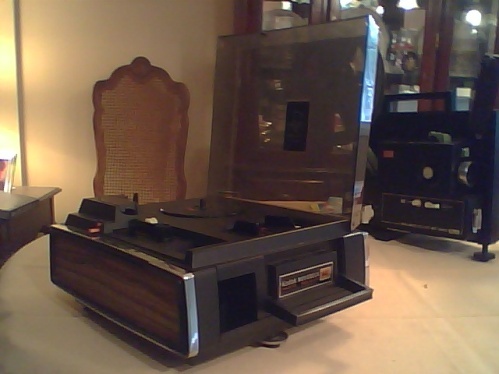 This is my very first movie projector, a Kodak Moviedeck 447 which was the Big Christmas Present from Mom and Dad in 1978. It is also the only one I'll ever have that arrived brand new. From when I started making and buying films that summer until then I had been watching them on a hand cranked editor. This was a big step up! It's also kind of a symbol of the identity crisis of Super-8 film at that moment. 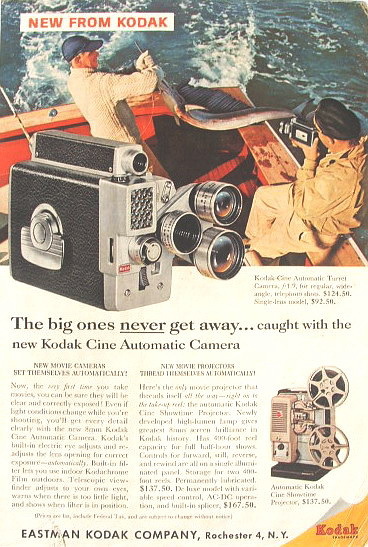 Early VCRs were in the stores and a vertical box with two reels poking out the top was starting to seem un-cool, so Kodak decided to "modernize" and came up with this armless wonder. The take-up reel is built into the bottom, the supply reel lays flat on a spindle up on the flight deck. It is capable of rewinding back through the projection path (an idea that terrifies me now...), and automatically starting rewind when the tail is anchored on the supply reel. Setup is nothing more than placing, plugging and aiming. It both tries and succeeds in being very "unfilmy". It looks like so much a slide projector when I've set it up people have said "I thought we were going to see movies!" This series has a reputation as film eaters, but at least in this particular case that isn't true. 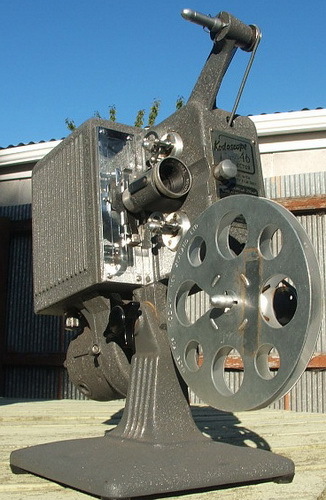 I used this machine 24 years before I got my first sound projector and it still shares with a Eumig I later bought the distinction of being my only machines never to injure a film. It also has what has to be the best autothread in the business. With a good leader it's pretty much 100%. The film path is astounding: zigs and zags and bends and corners. If you open it up the design is actually pretty clever and a lot simpler than you’d ever guess. The build quality is excellent, and the machine is very quiet, especially once that cover is closed. The biggest gripe of all is the gate is pretty deeply imbedded inside and to “clean” it you need to pop out the lens and twiddle a paintbrush through the opening. This is like brushing your teeth through your ears! Because of its pull out screen, it often serves as a viewer for reels back from the lab, or on the table while I'm editing films. Those few big show outings are Regular 8's in front of a crowd. So I'm in no hurry to buy another one, but because of what it represents to me you'll never catch me selling this one either. 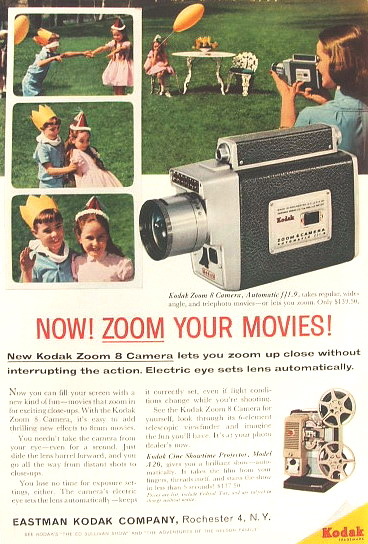 -that the classic Kodak projector isn't a Pageant or a Moviedeck, or an "Ektasound Ultra-400 Moviechrome" or any movie projector at all, but the humble Kodak slide projector? -back in the day they were everywhere! If there is anything that got a harsher rap than "home movies" in times past, it was the dreaded "slide show". In the wrong hands, it was just a means of force-feeding bad pictures to an audience: poor photography, poor editing, no context and of course the dreaded empty slots and slides upside down, flipped mirror image and sideways. -not to say that in the right hands and with the right story to tell it couldn't be a masterful medium...it's just that those stories and hands proved unfortunately...few. Legally, this is my Kodak 650H. Morally, it’s my Dad's and will remain so even if it becomes my son's some day. There was a time which feels like about four days ago when it shared a dining room table not too far away from here with my movie projector. Now it's often on my own dining room table with several of my movie projectors, recalling days when Dad would pick up film for both of us when he was out at the camera shop, and often we’d both have something to show. -back in the '70s it was an "arrangement", today it's an honor. Autoload, no less, thanks to the somewhat Frankensteinian arms in the back. They clamp around the spindle, and release with a touch when the film has arrived. 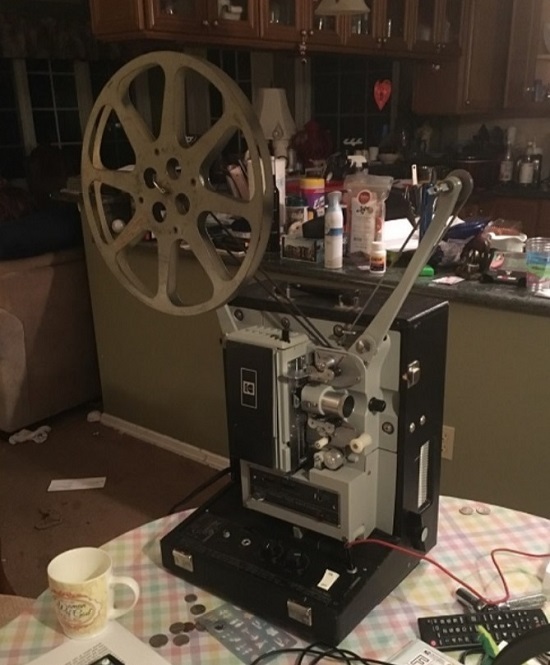 I can just imagine Saturday night...a rental from the Kodascope library, and dad threading the machine, wife and kids waiting with excitement. The projector runs pretty much like the day it was made. As long as it gets a bit of oil now and again, it soldiers on, 72 years later, with a terrific lens and great picture stability. It also has variable speed which can go quite low and still be watchable. Pretty little thing, but she lost her front lens element somewhere along the way, so for display only. I love the color-coded rangefinder with "Wide" "Medium" and "CU" indicated. I've had "old '28" now since 1986 when she was given to me as part of a group of decorations in the first video company I worked for. They were kind enough to ask me before throwing her out. Those projectors look immaculate for there age they must have been well looked after...great find. Funny you should mention slides we had a slide evening a week ago and it wasn't even my idea... my daughter asked for it, she reckon's the slides look a lot better "its that old look" whatever that means compared with anything her digital thingy takes. The Canon FTB from the 70s still takes good shots. I bought five rolls of Kodak Elitechrome slide film last year and have two left. This film has strong colours and looks great. jumping back to home movies, here are a couple of adds from the past. 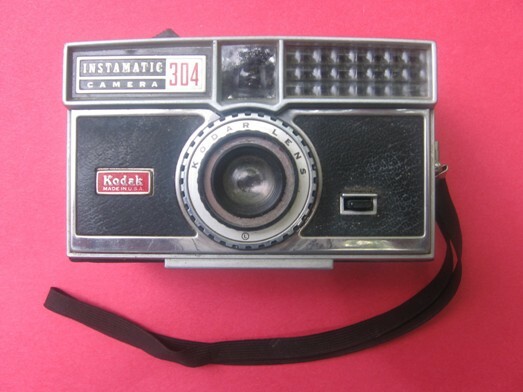 Thanks everyone for adding to this topic its all very interesting and hope more "Kodak" related stuff can be added. Slides can be wonderful with that huge frame and "zero blade shutter" in the aperture. They are at their best when they are of an interesting subject and an interesting speaker is holding the remote. 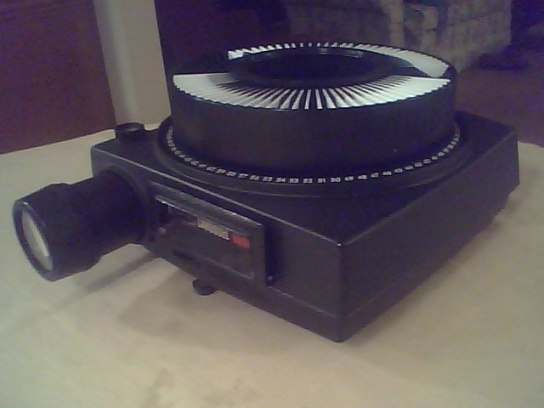 Not to get too far off topic, but my wife inherited a Revere slide projector and a ton of slides from her parents. Since those slides are in the linear style slide magazines they can't easily be shown using Dad's Carousel machine. We decided we wanted to show our son that we were kids once too, so I've been bringing the Revere back to life. 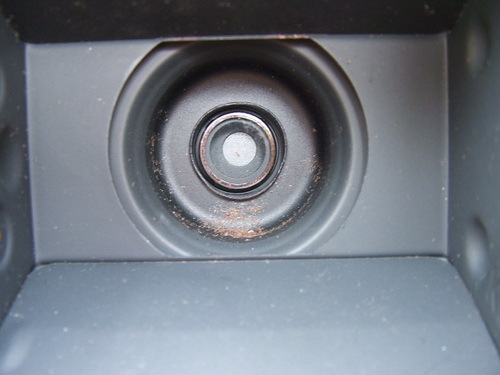 Last weekend I cleaned all the dust out of the interior, moved all the combustibles out of the blast zone, plugged it in, made sure I wasn't touching ground anywhere, closed my eyes tightly and turned on the power switch. -back to Kodak...I sure wish they were in carousels! I don't like using appliances that were designed with the Hindenberg! 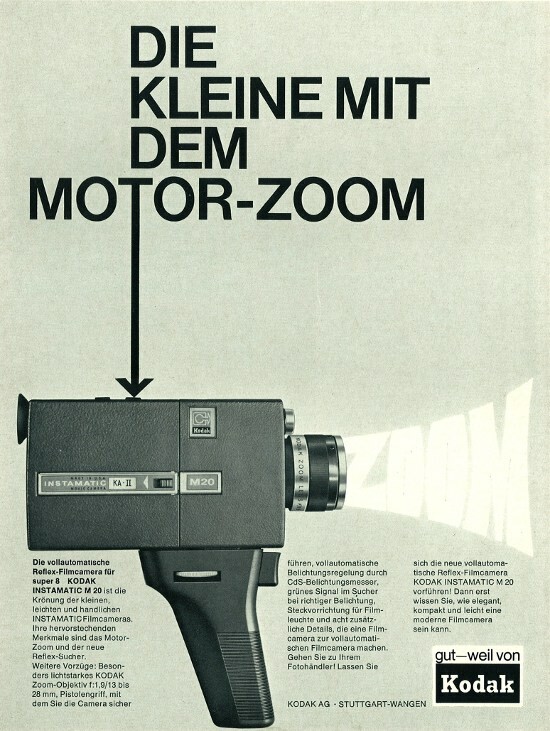 The Kodak M2 is to later Super-8 cameras what a stone axe is to a metal lathe or a drill press: primitive but important. This was the first production camera to use the Kodapak Super-8 cartridge. If you were shooting Super-8 that year, this was state of the art. After all: you didn't have to wind it up and you could shoot 50 feet without stopping. It has the shape (and the ergonomics) of a brick. There is no zoom, no metering and the viewfinder just seems to be a tunnel through the fuselage with glass at each end. There is exposure control in the form of a manually controlled iris and a table on the side of the camera with suggested settings. Sure enough, when (just for laughs) I tried putting batteries in it and pressed the trigger it just made this thin whining sound like it was having a kidney stone. Typical of early Kodak Super-8 cameras, their gears seem to be made of either balsa wood or some kind of macaroni and finding a working one is almost a miracle, especially if they stay that way for more than a cartridge or two. Just around the time I met my wife I found a Kodak M22 new old stock in a photo shop for 5 bucks. This was like the M2 but more plasticky. Still the same before its gears self-destructed it helped us save our first couple of months together so we can still enjoy them. It's amazing how good the images coming out of these cameras can be: good enough to be transferred into our wedding video as a matter of fact! 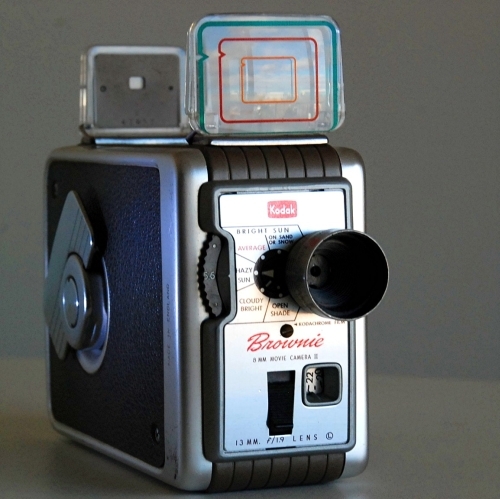 If you grew up in North America and were born anywhere prior to about 1970, the odds pretty decent that when you were a kid and somebody said “Movie Projector”, this is the image that flashed in your mind. Most families didn’t have home movies, so it was unusual to see an 8 or Super-8 machine even back then. The ones at the cinema were in the booth and usually went unseen. The Pageant on the other hand was everywhere. At basically every school there was an “AV” room with a small herd of Pageants. 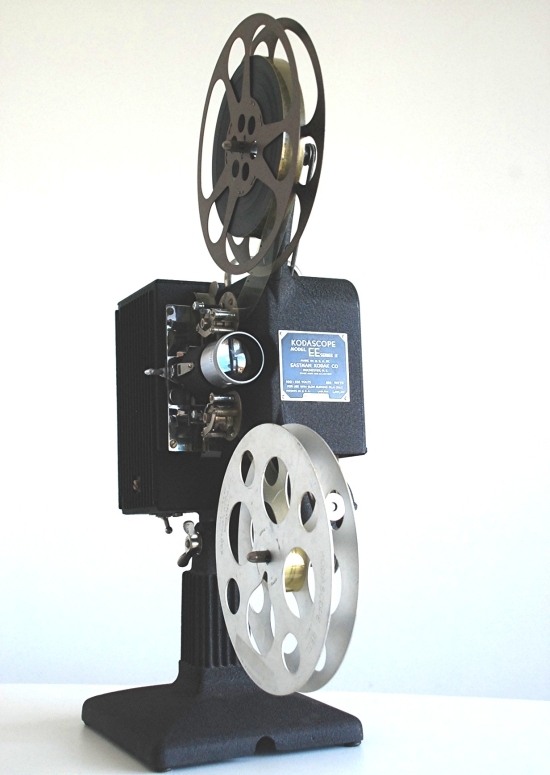 No matter what type of teacher someone might be, they became very experienced running films on these: it was an essential job skill. To me, seeing one of these still brings a burst of happy endorphins. When I was in elementary school through undergraduate, that sight meant there would be no lecture, no illegible scrawl in my notebook to decode later, probably no homework either. –all that and I got to see a film too! There came a time when VCRs started to show up at schools. It made perfect sense: they were cheap and easy. You could have one in every room and the AV room became available for the new computer labs that were happening just around the same time. I’m sure some of the teachers missed their Pageant days, but probably not all of them. Unemployed Kodak Pageants are waiting for good homes all over North America. I "adopted" this one late last year. It’s my very first 16mm machine and it came even after my video projector showed up. It’s still stenciled for a college in Wisconsin and it’s got a number: just one of maybe many. Right now, a 10 foot, ¼” monaural male to male cable is on order: it’s the first step towards this thing connecting into my sound system and fully joining the show! It's part of the joy of this hobby: even before you think you've reached some dead end, there is usually a turn you can take a and start something new. I had forgot about this topic, its been a while. When I was at school in Glasgow I never saw a film projector in use. I guess there must have been one somewhere but we never saw it. 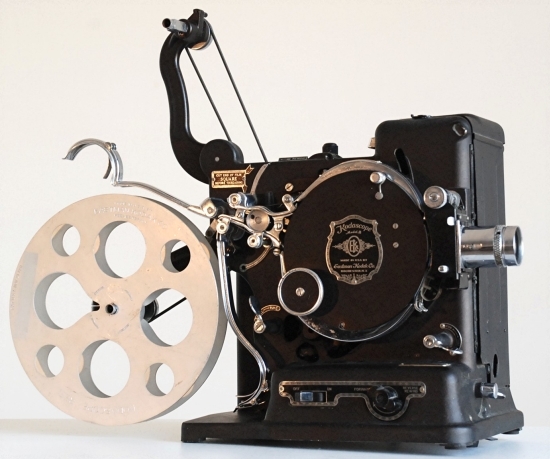 The first time I watched a 16mm projector in action, was when some kids from a local children home, when I was about 10 or 11 years that I went to school with, invited me and another friend to a weekend screening at the home. We all sat on the floor and I must admit I found the Disney wildlife film boring. I also remember some of the kids saying they were of to Australia as if it was some great adventure. Years ago I came across a book by accident, written by social worker Margaret Humphreys, called "Empty Cradles" which painted quite a different picture of the results of that so called great adventure long ago...its a terrible account. Anyway that's where I watched my first 16mm film.